This has been a fun filled Egg Week with TinkerLab. Hope you've enjoyed all our experiments and activities with eggs. Be sure to check out all 10 of our ideas from the week if you haven't. We both have ONE MORE IDEA to share! This time we did an Experiment with eggs and different beverages. This experiment is so easy peasy. 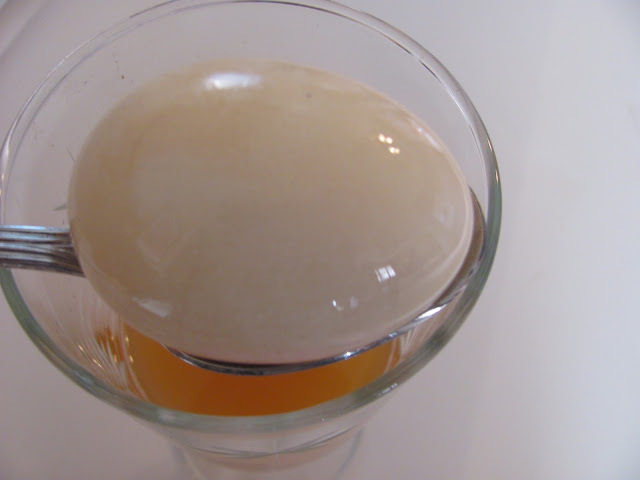 All you need to do is put a white egg in each glass that you have and pour the beverage in to cover the egg. In our glasses we chose to use apple juice and a dark colored cola. I asked C what she thought would happen to the eggs. She thought maybe they would change colors. We mostly drink apple juice in our household so C wasn't even sure if she wanted anything to do with the cola. After a couple hours the cola made the white egg light brown.....that fast! The apple juice made the white egg a light brown too. A day later the eggs were quite dark so I explained to C how the eggs got stained. I asked her, "What would happen to your teeth after drinking apple juice if you never brushed your teeth?" My daughter concluded that her teeth would get brown like the eggs. So I had C take an old toothbrush to see if she could get the eggs clean. The apple juice came off in brown little chunks. The dark colored soda had to be really scrubbed. Both were not easy to clean. 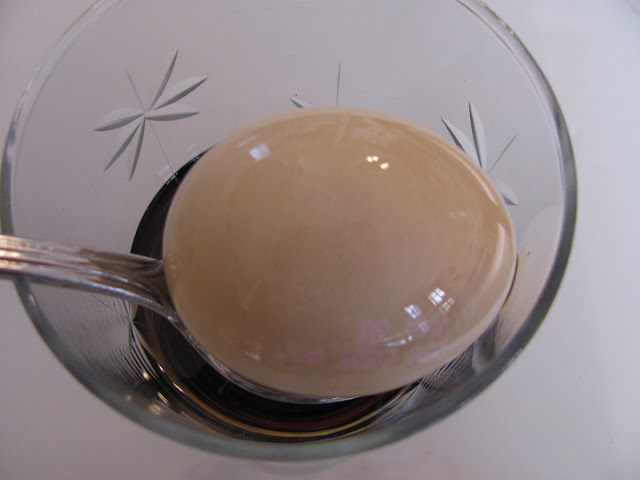 Here is the cola submerged egg half cleaned. It makes you really think how important it is to brush your teeth after seeing this. How would the eggs look after more time? Probably worse. This experiment is a good lesson in dental health. I know I will be referring back to this experiment from time to time to remind C about the importance of brushing your teeth. 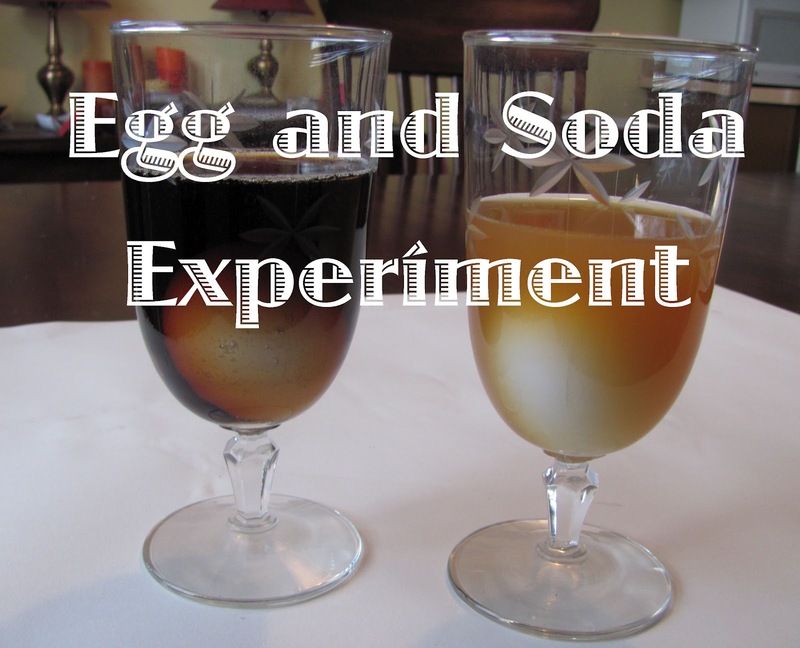 On You Tube there is an experiment with a dark colored soda in which they left the egg for one year...365 days. Take a look at the video here and you may think twice about drinking colas or at least it will encourage you to brush your teeth. The shell of an egg contains calcium, sodium, and phosphorus....and after 365 days the shell disintegrated. ***Be sure to hop on over to TinkerLab to find out what cool experiment Rachelle has in store for you today. Let us know how you enjoyed Egg Week and our 10 Easter Egg Activities. Will you try any of these ideas? When you get a chance please share with us the FUN (or not so much fun) that you've had with any of these Egg Activities. Thank you Rashmie. I think it would be great to try all types of beverages. This experiment is one we are doing this weekend. I had wanted to do it for dental health month but never did so figures Egg week was the next best time. Cool results! That video about the disintegrating egg shell, has me proud of the fact that I quit drinking soda recently! YUCK! Great minds think alike! Can't wait to see your take on the Egg and Soda experiment. This is ingenious! Perfect activity for dental week! Thanks Esther. It definitely drives the point home about the importance of dental health! Fantastic. The only experiment with eggs we've done was the famous "Dead Sea experiment" with fresh and very salty water. We don't drink sodas either here. Thanks. We will have to give the "Dead Sea experiment" a try. Thanks for the idea.